Write a description of this setting. Which adjectives and descriptive techniques could you use to convey the amazing colour? Why did the birds come here? What time of day do you think this might be? 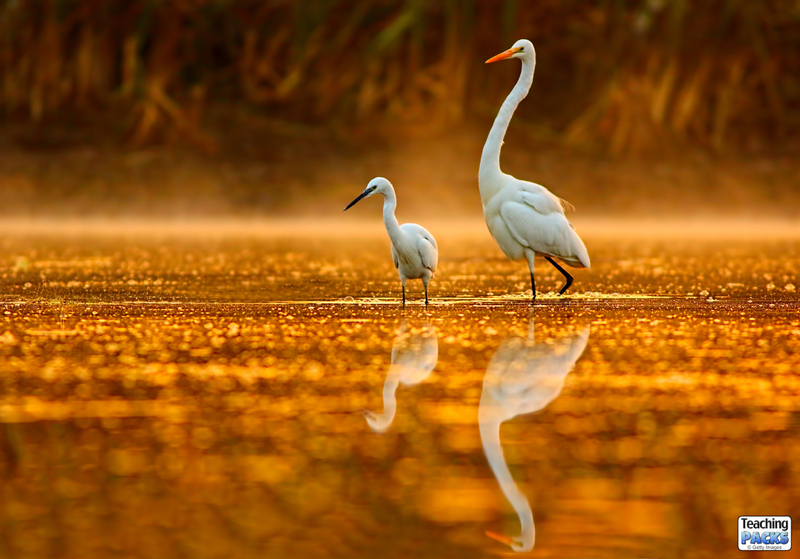 The birds in the picture are a Great Egret and a Little Egret. Research these two species, where do they live, what do they eat? Create a fact file. Where in the world might this picture have been taken? There is lots of information about the Little Egret here and the Great Egret here. Try taking your own water reflection photos. Using a shallow tray filled with water, or a puddle, stand an object so that it is reflected in the water and take a picture. Egrets are part of the heron family. Find out which members of the heron family can be found in your area, and where. What type of habitat do they prefer? This page has some useful information.